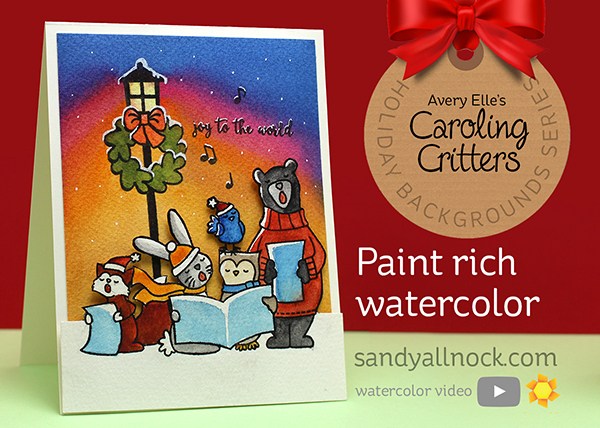 While watercolors can be soft and lovely, they also can have a lot of punch! Layering washes over each other to build up rich color can be well worth the patience of waiting in between. Check out how I created the fun background as well as the painted stamped images! Watch the video below or click HERE to see it in HD on YouTube. Hi Sandy! 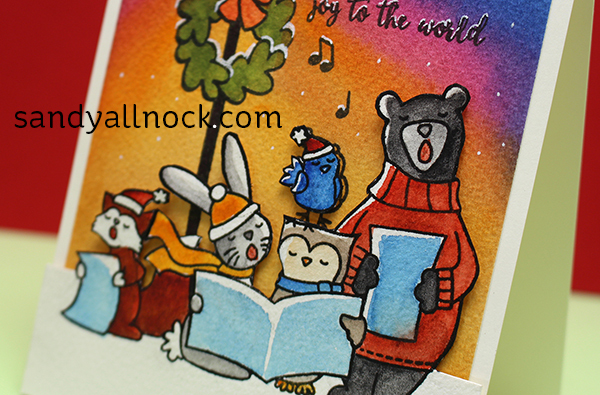 Love the vibrant colors used in this card! Especially the background. But my favorite part is the added snow with your white gel pen!! Just discovered your blog and feel very inpited! Thank you for that! Love this card, Sandy. I’m always inspired by you and this water coloring is a prime example. Thank you. This is lovely! I often think watercolor is a bit too pale for me because I prefer bright colors. But your card is proof that I can get rich deep colors with watercolor. Thanks for the video. I love that you explain your thinking as you go through the process. Loved watching the process of this card. I am working on Christmas cards now.